Like many women who wanted to make a little extra cash from their selling older luxury goods, Jaclyn Shanfeld had been using online consignment sites and marketplaces to sell her designer clothes and handbags she no longer wore, and quickly became frustrated with the experience. In one situation, she sent a box of designer clothing worth $4,000 to an online consignment store, only to receive $20 in return. Online consignment, she decided, needed to be disrupted. Her answer is Shop-Hers, an online marketplace for luxury goods she has co-founded with two others. The startup, which launched last Fall, is announcing $3.5 million in funding today from a group of all-star investors. The round was led by Floodgate, with Elevation Investors, an investment entity which includes Bono and Patty Wexler; David Tisch of The Box Group, Aldo Manzini, Shana Fisher of High Line Venture Partners, Sarah Fiszel (an early VIP seller and site adopter), and Mike Hirshland of Resolute VC participating. The startup had previously raised a seed round from Fisher, Hirshland, Brian Lee, SV Angel, Jeremy Zimmer, Paige Craig and Ryan Steelberg. At a basic level, Shop-Hers gives women the ability to buy and sell pre-owned designer merchandise within a social selling. But with Shanfeld’s ambitions of taking away the pain points of the online and in-person consignment industry (a market worth tens of billions in spending), her and her co-founders (which include the former CTO of Shoedazzle and the former creative director for Nordstrom)set out to actually use technology and community to make consignment transactions frictionless and sell these goods to a broader audience. Here’s how it works. Sellers of designer goods can either upload their own pictures of items to the site or sign up for the VIP experience. Via the self-upload experience, sellers upload a photo of the item, and tell Shop-Hers what designer made the item. The startup actually has a list of designers to pick from, as to limit the merchandise to luxury items only. Sellers can select an asking price and designate white type of item it is (i.e. dress, tote bag, high heels). The startup will suggest pricing based upon comparable prices on other sites. But Shanfeld says that generally most merchandise is priced 50 to 60 percent less than retail price, but it’s really up to the seller to designate a price she is comfortable with. Once the item is sold, the seller has to send the item (using a prepaid shipping label) to Shop-Hers, where the startup authenticates each item before the buyer is actually charged. This is how the startup is preventing knock-offs and fake, misrepresented items from being sold on the sites. Shop-Hers takes 18 percent of any sales from user-generated sales. VIP sellers basically outsource all photography, shipping and can be featured more prominently on the site. These sellers, which are selling mostly high-end items, simply ship their items to Shop-Hers and designate prices. The startup will create closets for these sellers on the site, and designate pricing (but the seller has final say). For these power sellers, Shop-Hers takes 35 percent. Shanfeld maintains these cuts and pricing is the best and most fair in the business, with the majority of the sale going back to the owner. Around 30-40 percent of seller are using the VIP service, she adds. As mentioned above, from the buyer standpoint, all merchandise sold on the site is authenticated by the startup’s experts. And Shanfeld says that each item is carefully wrapped and presented in a clean, luxurious way so that the buyer has a luxury experience even when she opens the package. This isn’t the case with other sites like eBay, where resold clothing and accessories are packaged by the seller. Upon signing up for Shop-Hers, buyers can also create a profile, designating their style, preferred designers, sizes and more. 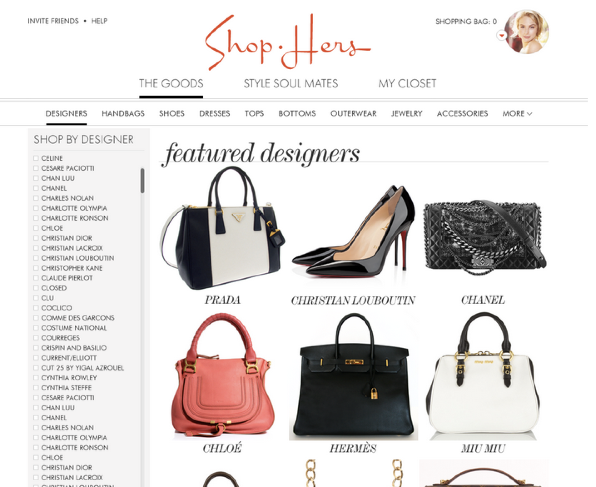 Shop-Hers will then create a special feed, called Style Soul Mates, which will match closets and sellers to buyers based on this data and purchase history. Other notable features include the ability to scroll over any item on the site and see an icon if the item matches your size. Shanfeld tells us that in the future the company will be adding a mechanism by which buyers and sellers can better negotiate pricing, and a way for sellers to know whether an item has been added to a buyers cart. And the startup plans to release native mobile apps. Within a year, Shop-Hers has quietly accumulated just under half a million users, with little to no marketing. She says sales have grown steadily month over month, and the startup recently even doubled numbers with introduction of international shipping a few months ago. Users seem to really love the experience, Shanfeld explains, because it is so personalized. In fact, as a testament to this, many users asked Shanfeld if they could invest, and she decided to take a small amount of investment from a few of her power-users. “It’s eBay meets Netaporter,” she explains. I’m a frequent user of many of resale sites that fall into this category, including eBay and Poshmark. Other competitors out there who directly compete with Shop-Hers include The RealReal, Thredflip, and Vaunte. I actually made a purchase a few weeks ago on Shop-Hers and found the entire experience as frictionless as Shanfeld claims. The item I purchased arrived within a few days and was in the same condition as it was advertised. You have to wonder whether eBay will eventually buy one of these sites. More than anything, the success of these marketplaces will depend on the ability to create a lasting community amongst buyers and sellers. That sense of community and human connection is what is missing in eBay. But eBay has what many of them have not yet been able to accomplish—massive scale.